Corby Town will celebrate their 70th anniversary by taking on a Glasgow Rangers XI in a special friendly match in May. The Steelmen will host some of the Scottish giants’ emerging talent at Steel Park on Wednesday, May 8 (7.30pm kick-off). It will be the first time since 2011 that Rangers have sent a team to Corby after they did so in November of that year to celebrate the opening of Steel Park. Led by Ian Durrant that evening, Rangers ran out 6-0 winners thanks to goals from Rhys McCabe, Juan Ortiz, Kane Hemmings, John Fleck and a late Salim Kerkar double. 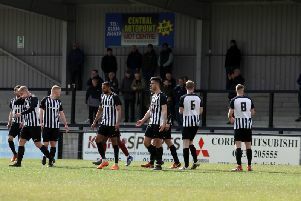 Now they are coming back for another friendly clash, which Corby will hope can mark a double celebration as they target promotion in the Evo-Stik League South Division One Central. And it will be an extra-special occasion for Steelmen boss Steve Kinniburgh, who played in the Academy at Rangers. He said: “Corby Town are delighted to have Rangers coming down to play in our 70th Anniversary game at Steel Park. “We hope to attract a big crowd for the game to hopefully celebrate a successful season for both teams come May. Mulholland added: “We are delighted to be able to send a team down to celebrate the 70th anniversary of Corby Town. “It was a match we were very keen to support for two reasons. Firstly, we know there is a huge Rangers fan settlement in Corby and it gives the supporters who maybe don’t get to Ibrox as often as they would like, the opportunity to see some of emerging talent on their doorstep. “The second reason was to support our former Academy player Steven Kinniburgh, who is still in regular contact with us here at Rangers, and is currently in the early stages of what will hopefully lead to a long and successful management career. Admission for the match will be £10 for adults, £6 for concessions and £2 for under-12s.